Jo and Paul Dyer are the tenant farmers of Knaveswell Farm, which is a dairy farm making up part of Dorset Council’s farm estate and is situated underneath Nine Barrow Down, half way between Corfe Castle and Swanage on the beautiful Isle of Purbeck. The Dyers have been grazing their small herd of Hereford beef, cattle on the 300 acres at Durlston Country Park since 2013. The cattle play an essential role in the park’s grazing and conservation management. The park rangers move the cattle between the blustery cliff top fields and the colourful wild flower meadows and so if you take a stroll about the park, you are most likely to bump into the herd somewhere or another. The cattle graze for 10 months of the year at Durlston, returning to Knaveswell Farm during March and April to give birth and to give the parkland a rest. Once the new calves are safely delivered, the whole herd is returned to the park and the cows get on with the important job of rearing their calves. The Hereford herd are completely grass-fed at Durlston; when they return to Knaveswell they eat meadow hay which is made on the park during the summer months. No sprays or fertilisers are used on the land at Durlston and the cattle are reared slowly, naturally and with very low-impact on the land. sales please do give the Dyers a shout! running in place of a daily specials board, We run a ‘7 mile menu’. 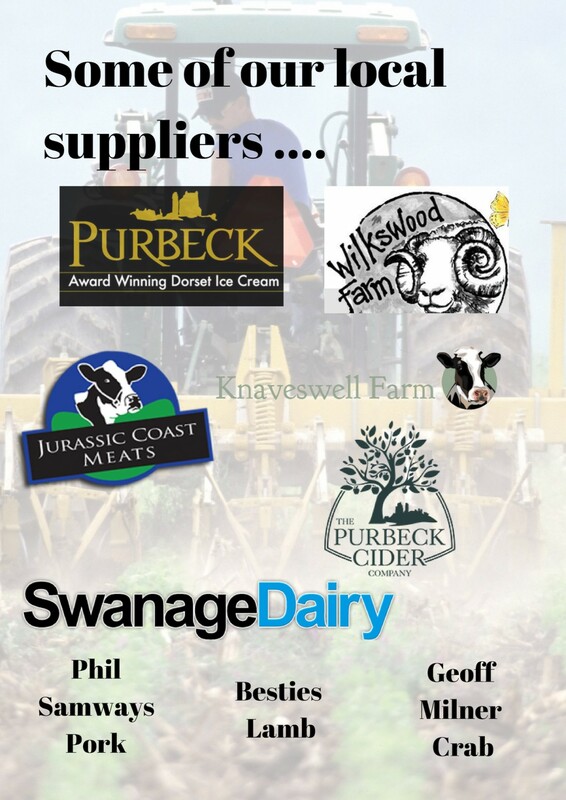 This concentrates on an independent supplier within a 7 mile radius of the castle, that raises and sells their own produce (please note sometimes this is a wider range due to wanting to expand on suppliers) The point is to raise awareness of the great tastes and talent that Purbeck has to offer. Supporting local producers is important to us and so we have been looking for a way to incorporate it into the menu, without our customers having to incur the additional costs this may bring and so we felt the 7 mile menu would be ideal.